Sir Laurence Olivier and Eric Porter narrate Jeremy Isaacs' epic documentary series, chronicling the events of the Second World War. 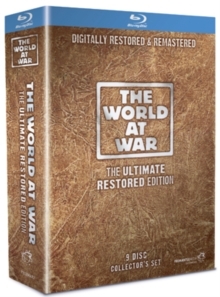 The episodes included are: 'A New Germany - 1933-1939'; 'Distant War - 1939-1940'; 'France Falls - May-June 1940'; 'Alone in Britain - May 1940-June 1941'; 'Barbarossa - June-December 1941'; 'Banzai - Japan Strikes - 1941-1942'; 'On Our Way - America Enters the War - 1939-1942'; 'Desert - The War in North Africa - 1940-1943'; 'Stalingrad - 1942-1943'; 'Wolfpack - 1939-1944'; 'Red Star - The Soviet Union - 1941-1943'; 'Whirlwind - Bombing Germany - September 1939-April 1944'; 'Tough Old Gut - 1942-1943'; 'It's a Lovely Day Tomorrow - 1942-1943'; 'Home Fires'; 'Inside the Reich - Germany 1940-1944'; 'Morning - June 1944'; 'Occupation - 1940-1943'; 'Pincers - August 1944'; 'Genocide - 1933-1945'; 'Nemesis - Feb-May 1945'; 'Japan - 1941-1945'; 'Pacific - Feb 1942-May 1945 The Island to Island War'; 'The Bomb - Feb-Sept 1945'; 'Reckoning - April 1945'; 'Remember'; 'Secretary to Hitler'; 'Who Won World War II? '; and 'Warrior'; 'Hitler's Germany - 1933-1939'; 'Hitler's Germany - 1939-1945'; 'The Two Deaths of Hitler'; 'The Final Solution - Part 1'; and 'The Final Solution - Part 2'. Isaacs also presents a special 'Making of' feature.